For years I commented to my husband on how I didn't know how to parent my little Zoe. From a young age it was very evident that I simply did not understand or "get" her. I remember one particular conversation with my husband a long time ago about how neither of us really understood her or knew how to interact with her in certain situations. She's highly emotional, easily frustrated, hurts at the slightest "not happy" comments, remarks, or corrections, retreats a lot if bothered, happy to avoid big gatherings, and is generally quiet in social settings. HOWEVER, this same child is generally outgoing and quick to warm up to new people and experiences (and super loud most of the time at home). She just totally stumped me all the time. Recently, after reading some articles online, I realized with sheer surprise, that my little Zoe is an introvert! Nearly everything I was reading out of these articles reminded me of Zoe on some level. I definitely would label her as an outgoing introvert, however, which is probably why it never occurred to me that she could be an introvert. Alas, the more I read about introverts, and the more I watch and observe her, the more convinced I am that this describes her perfectly (I also recently learning that the term "outgoing introvert" is an actual thing). I'm an extrovert. My husband's an extrovert. My other children are extroverts (Levi is only 2 1/2, but so far I think he'd fall in with the extroverted bunch). We love all things people...having them in our space, being in their space, sharing our lives, them sharing with us, etc. We have a hard time NOT having people over regularly. My husband struggles with a lack of people in our home more than I do, which I chalk up to me being the one left with the "work" of hosting people in our home. One of the top 10 questions asked in our home is, "who can we have over for...". We are like your total, stereotypical extroverts. And then there's Zoe, who is very different from the rest of us. She loves people, too, but doesn't like to deal with too many new people or situations. She doesn't crave being around people like the rest of us do, and she is typically just fine skipping whatever awesome homeschool class I find for her in favor of running errands or staying at home with me. Her general response to just about any sort of activity, whether I can tell that she loves it or not, is that she "hates it." So what do you do when you and your extrovert husband realize that you're raising an introvert? Panic. The answer is panic. And act confused. And fear that you've damaged your child all these years. And then get over it and move forward and promise yourself to do your very best at re-learning how to best parent and interact with your child. For a long time, I really didn't understand her. I still don't, really, though since I've nailed down this personality trait, I've been working REALLY hard at understanding her and learning how to interact with her in a way that meets her needs. 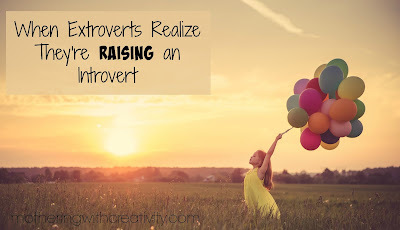 It's a challenge, seeing as many years ago I used to wonder what the heck was wrong with introverts (the answer, I know now, is nothing is wrong, they are just different than me). Because I'm such an extrovert, I always assumed that when she'd sneak off from the rest of her friends, something was automatically wrong (because why the heck would you leave friends unless something was wrong?). I'd ask her repeatedly, "are you okay? ", "did something happen?" and she'd always say, "I'm fine." I've since started to give her some space in these situations, smile at her if she catches my eye, and will only go speak to her once, asking her instead, "do you need a little space to be alone for a bit?" The answer is usually, "yes," and I just let her be. *I'm learning to ask myself "how does Zoe see this situation?" as opposed to just assuming what is going on from my personal perspective. *I'm allowing her to occasionally opt out of certain non-essential activities or classes in favor of quieter time at home with me. *I'm allowing her to enjoy her early mornings alone to do whatever she pleases while the house is still quiet and fewer people are around (she's usually up before 6:00 AM, though my husband is often up earlier than that). *I'm not assuming that she's upset when I see her alone, but rather embracing that she sometimes needs some time alone to recharge. There are so many things I have yet to learn about my little outgoing introvert. 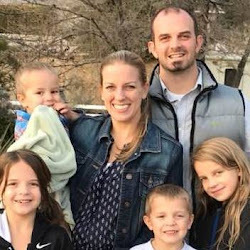 I want to support each of my children to flourish in their own unique ways, and I am finding that I need to put forth a little more effort when it comes to Zoe. If you're an extrovert reading this, I'm sorry I don't have all the answers for you. I hope, though, that at the the very least you've felt a bit more inspired to really listen to your child and seek out how to parent in a way that is meaningful and supportive to them. For me, a little inspiration has gone a long way in wanting to make her life a little less overwhelming or obnoxious with my extroverted questions and pressures. Parenting is a fun, difficult, ever evolving journey, isn't it?